Source: Watercolor by an Indian artist, Wellcome Collection via Europeana, V0045558 b1576305 Iconographic Collection 576305i g6jpe9feCC BY. This post has been written by Marissa Young, trainee at EUROCLIO. The hour long workshop focused on demonstrating to participants how Europeana source collections on Historiana—specifically the Women Working source collection—could be used in the Historiana eActivity Builder to help students critically analyze visual sources. The workshop was generously hosted by Dr. Tim Huijgen, professor of History education at the University of Groningen. Participants were trainee teachers enrolled in master’s level education studies at the University of Groningen and all were working part-time as history teachers at local schools. The workshop began with an introduction by Steven Stegers (EUROCLIO), who shared background information on Europeana and Historiana with the participants. He introduced the trainee teachers to the basic functions of Historiana. When asked to create a Europeana source collection for this workshop, I was inspired to focus on representations of women for two reasons. One, a personal interest in women’s history and two, due to the relevance of March as Women’s history month. As I browsed through Europeana looking for visual sources of women I was struck by the number of sources showing women washing clothes, grinding grain, weaving cloth, hulling coal, healing others, and producing goods all across different cultures. These images offered a different interpretation of women workers than the now popular celebration of women entering the workforce as a result of wartime labor shortages. These images showed that women throughout history, and across cultures, had a more diverse profile of work than often acknowledged. While curating this collection, my criteria for selecting sources was that they had to show women actively engaged in doing work, and that the work was not dependent upon a grand moment in history. Resulting images show the everyday experiences of women. What caught my attention, when looking at the complete collection, was that women’s work usually had social component represented. Women did their work with others, mostly other women. In many of these sources there is a sense of community, collaboration or assistance among the women. Does this social element represent the actual conditions of women’s work? Or do these sources serve to further the stereotype that women are the social gender? There is much to explore in this collection, which is why we felt it would make for an interesting workshop on analyzing and comparing sources. During the workshop I reviewed the concept of representation with the participants. Representation is the production of meaning of concepts within a culture. One participant gave the example that teachers are usually represented as standing in front of a board, wearing glasses, and probably holding an apple. When we see the board, glasses and apple and we recognize this person represents a teacher. Representation is a process we constantly engage in, yet do not t usually stop to consider. However, taking the time to contemplate representation in an image can help students learn how to analyze and discuss visual sources critically. A great tool for teaching students to view sources critically is the Analyze tool in the eActivity Builder. The tree is arched over and all the leaves are pointing in one direction (description) which indicates this landscape is windy (meaning). 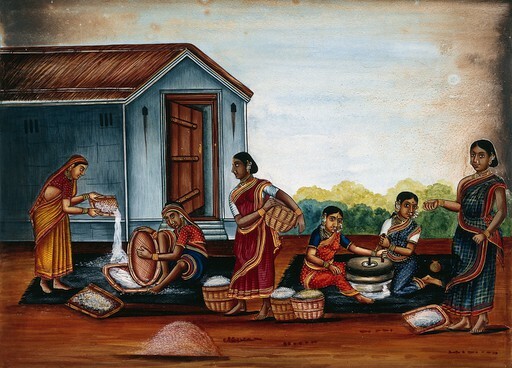 Participants were asked to assume the role of students and make at least three annotations on three images of washerwomen using the annotate feature in the eLearning Activity. Participants discovered how this simple tool can be used to help structure students’ process of visual source analysis and prepare them to answer historical enquiry questions with reasonable and justified evidence.